For new comers, please see our Autocross Registration Guide to get started and the Rules & Regulations page for additional info. We have 3 competitive classes this year which means more trophies and remember, you don't need a fast car to run and have fun! Registration opens at 10:00am and closes at 11:30am, no exceptions. Driver's meeting at noon and racing beginning at 12:30 PM. Spectating is free! 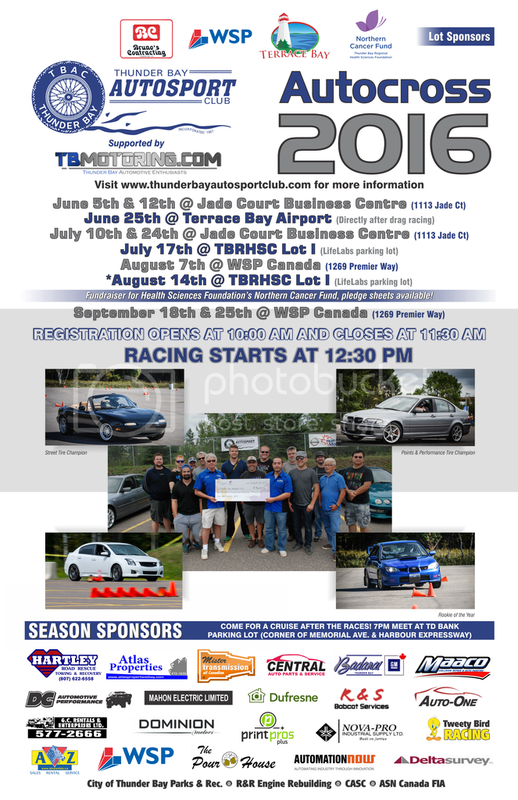 This year, the Autocross Fundraiser for Northern Cancer Care will be held on Sunday, August 14, 2016 at Lot 'I' of the TBRHSC. Race fee is $50 or only $20 if you raise $100 or more in pledges. Pledge sheets are available, please let me know and I will drop one off. In addition, on Friday, August 19 we will be putting on an autox demonstration at the CLE from approximately 6pm-9pm. Spectators are welcome. Below you will find the list of drivers for this fun, not-for-points event. A friendly reminder that this Sunday is the first autox of the season!! It will be at WSIB parking lot behind Central Car Wash. Please come on time to register your car if you're competing. Autox is a go for anyone wondering. Should be dry by the time we race. Just a heads up registration will open at 10:30 because I locked my keys in the car with the laptop! Please arrive before 11:30 though if you plan to race. Results have been linked in the first post! Here are Some Photos From Today's event. My apologies if I missed your car and its not in the album I will be adding to it. Feel free to edit or use these photos. Added event poster to first post. Thanks for the pictures Evan! This just in, I've secured the hospital lot for July 17 as a standard race day to help grow the fundraiser in August. I'll be printing pledge sheets and have them available at the next event so hope to see some extra strong fundraising this year! an Extra Hospital Lot event.... Love'in it! Good job Sacco! You're the man! What time is the auto x during the test and tune? I ask because I'll finishing my last night shift at 7 am. Hoping I can get a bit of sleep and show up later in the day. Drag racing is shut down at 5pm on the Saturday so we need time to head over and plunk down some cones. Let's say our racing starts at 6pm - if they don't have someone blow up right at the end like last year, haha. It would be helpful if you showed up earlier to register or at least give us all your completed forms in advance. Today's results up in first post.